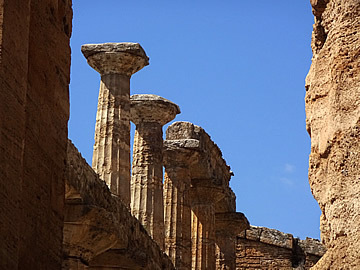 One of the most impressive sets of Greek temples anywhere. 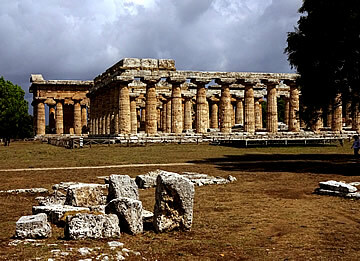 Paestum had changed a lot since we were here nearly twenty years previously. The temples were the same, looking in very good shape, but there were a lot more tourists here and a huge visitor centre. 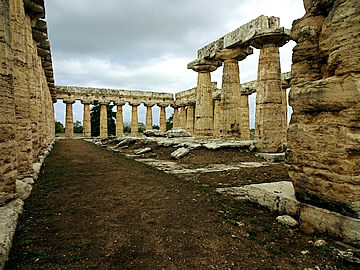 In 1998 there was very little apart from the temples and the other ruins on the site. 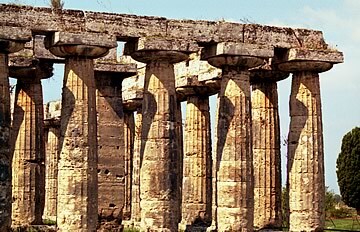 The Doric temples at Paestum are famous, but in 1998 perhaps not so well-visited as the more traditional tourist venues in Southern Italy such as Pompeii and Naples. Then we stayed in the converted stable block of an ancient palazzo on the outskirts of the "new" town, south east of Salerno, and were able to drive to the archaeological site in about ten minutes. Above 1998, below 2017 - not much has changed. The small shops opposite the entrance to the site sold guide books in 1998, although the only English guide book we could find looked to be about as old as the site itself! There was a good map available in 2017 though, which identified all the major buildings on the site. In 1998 there was also a decent pizza place here but pizzas were not available at lunch time due to the time it takes to prepare the traditional wood-fired ovens! The ekklesiasterion, where political meetings were held. 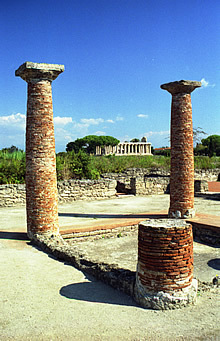 Columns around the impluvium of a courtyard within a typical Roman home. The roof above was open and rainwater would drain from here into an underground cistern. Greeks from Sybaris founded a city here in the 6th century B.C. and named it Poseidonia in honour of the god of the sea. The city was invaded in about 400 B.C. and overwhelmed by the Lucanians - an Italic people of the mountains - who renamed it Paiston or Paistos. Briefly retaken by Alexander's nephew in 332 B.C. the Lucanians were finally defeated by the Romans in 273 B.C. Entrance to the 1st c A.D. Roman Amphitheatre. 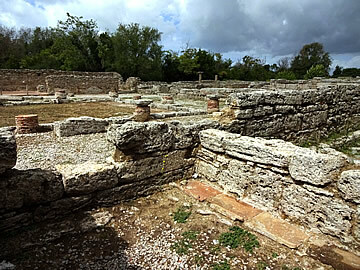 Remains of the gymnasium with swimming pool. 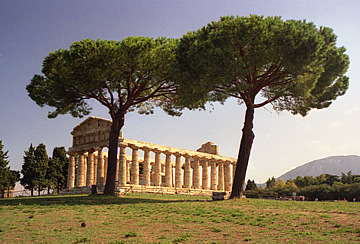 The Roman colony at the newly named Paestum was a Roman outpost, supplying ships and sailors in times of need. Trade prospered but the population was decimated by malaria caused by the silting up of the river Salso south of the settlement. In the 9th century the much reduced population retreated to the mountains, perhaps finally driven out by Saracen raids. The city was left to decay until it was rediscovered in the eighteenth century. 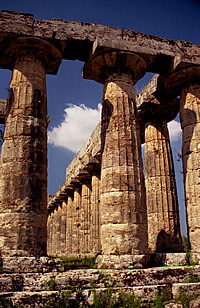 Paestum saw a further invasion in 1943 when the American Army passed through following the British-American landings at Salerno. Typical remains of the residential areas. 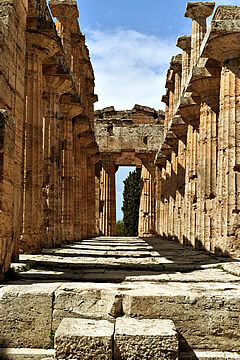 Entering at the north end, close to the smallest of the three magnificent temples - the Temple of Athena. Built around the end of the sixth century B.C. this beautiful golden stone temple is the smallest of the three on the site. As with all three temples, the altar is placed outside and to the east of the main building. Between the Temple of Athena and the two larger temples, Neptune and Hera, lie the remains of the Roman town - low walls for the most part but still indicative of a bustling city with an amphitheatre, forum, shops and houses. 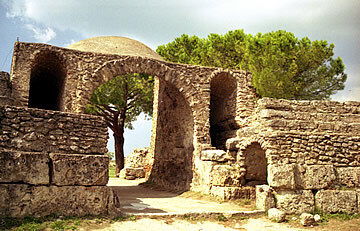 The Sacred Way begins at the southern Porta Giustizia and runs northwards; at the Forum it crosses the decumanus maximus - the main east-west road passing through the Porta Marina to the west and the Porta Sirena to the east. 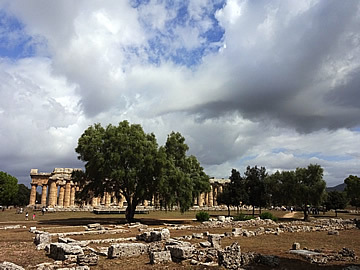 It runs west of the two greatest temples - the Temple of Neptune lying north of the Temple of Hera - with a large residential area running the length of its west side, no doubt full of shops with their attached homes and other commercial outlets..
Temple of Hera and Temple of Neptune from the east, 2017. 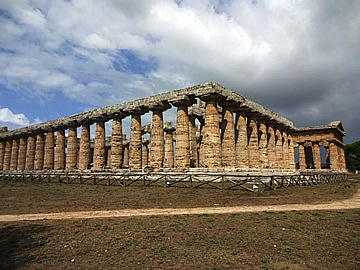 Temple of Neptune from the east, 2017. 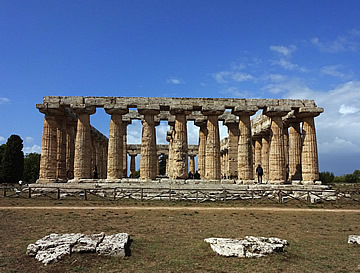 The Temple of Neptune (Neptune was the Roman name for the Greek god Poseidon), the largest of the three temples, dates from around 450 B.C. and is remarkably complete, being composed of fluted Doric columns, 6 on the east and west faces with pediments, 14 to each long side. The cella in the Temple of Neptune. 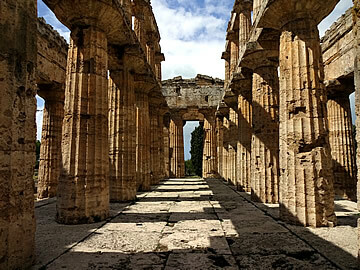 Inside there is a columned porch at each end between which is the cella - the true residence of the divinity and, therefore, the most sacred part of the temple - within a double row of seven columns. In 1998 the temple was shrouded in scaffolding and netting but in 2017 we could see it properly. 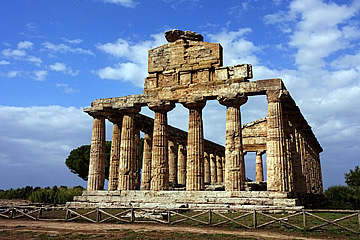 This temple, the largest intact Doric temple in Italy, is magnificent and very well preserved. Temple of Neptune from the south, 2017. Temple of Hera seen from the Temple of Neptune. 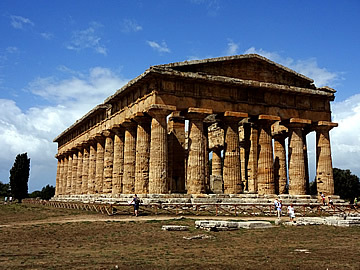 Temple of Hera, Temple of Neptune behind from south east. 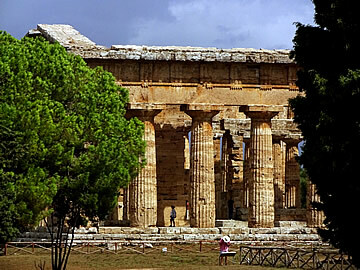 Temple of Hera showing columns of the internal cella with an unusual square column at its corner. 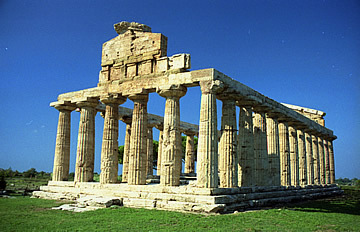 Temple of Hera, Temple of Neptune behind from south west. 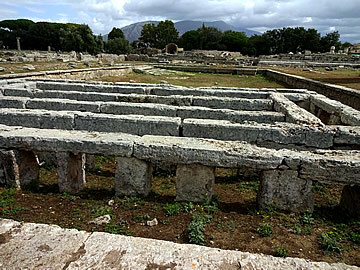 The Basilica or Temple of Hera is the oldest temple, built around the middle of the sixth century B.C., and originally called the Basilica because the first archaeologists mistook it for a civic building. It has nine columns on the east and west fronts, and eighteen along the sides. 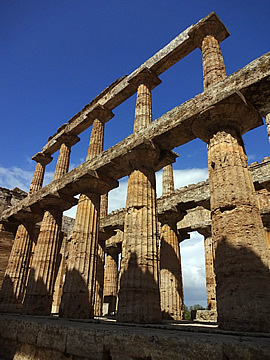 Inside, as in the Temple of Neptune, is a cella. From the south west, 2017. In 2017 we drove here from Pompeii where we were staying. We were looking forward to lunch at Fattoria del Casaro where they make mozzarella. We had a selection of meats and cheeses but felt the mozzarella. was nothing special and the three hard cheeses all tasted the same, nothing special about the meats either. Rather disappointing. 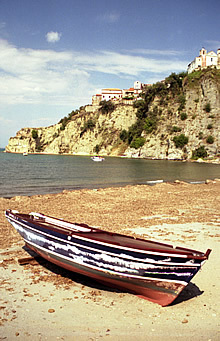 In the Zona Archeologica the best meal we had in 1998 was lunch at the Ristorante Nettuno. This was also the most expensive meal we had but at L94000 the three courses and excellent bottle of wine were well worth it (approx L2500 to £1 at this time!) We also enjoyed a meal at the Hotel Helios where, when we declined to try the traditional starter of three largish balls of mozzarella. on the grounds that it would be too filling, they insisted on bringing it to us free - and it was excellent. This is an area specialising in authentic mozzarella made from the milk of the buffalo which can be seen grazing around the countryside. The Hotel Ariston American Bar is well worth searching out for pre-dinner drinks and, also in nearby Laura, da Nonna Sceppa served good pizzas. 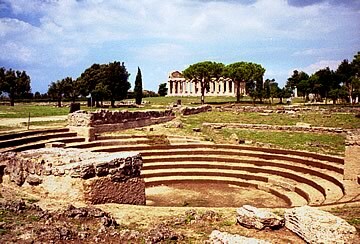 South of Paestum Agropoli is a little older than Paestum, also founded by the Greeks, though without the spectacular ruins. In September 1998 it didn't have a great deal to offer apart from the picturesque harbour and the old town perched on a promontory. This part of Italy seems to close down after the summer, the beaches were deserted - and can be dirty - and it can be quite difficult to find somewhere to eat. 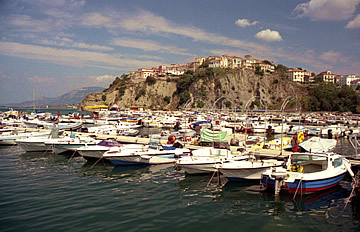 We found one very good restaurant in Agropoli, open on a Sunday and full of Italian families eating a leisurely lunch.